It started with a pie. Yesterday, Rylan stopped over because where she lives was being restarted. Of course, being Rylan, she didn’t wear pants as she burst into the house. But we’re used to her, so whatever. She decided for my birthday, she’d make me a pie. And for, you know, breaking and entering into our house. Pantsless. Lexi decided to send me a birthday cake. It was a nice cake, all pretty and colorful. I set it out on the kitchen counter so we could have cake later. But Rylan didn’t like that the cake Lexi sent me was bigger than the pie she made. 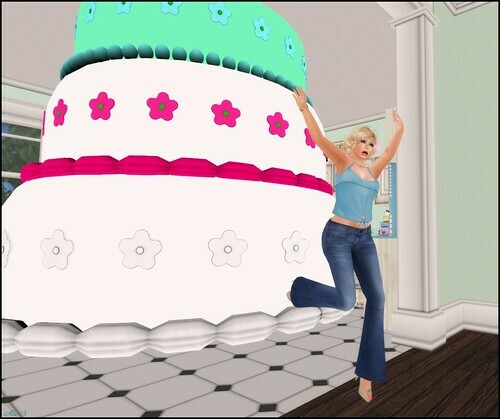 So while we slept, she broke into the house again [I really should just give her a key] and she made me ANOTHER cake. It’s a big cake, with lots of flowers trailing down the sides. It’s quite lovely! And it’s bigger than the cake Lexi sent, which was her intention. However, Lexi wasn’t about to be one upped by this cake. Ohhh no! She baked YET ANOTHER cake for me. It’s huge and has stars and she got kind of messy making it. I wasn’t even sure if it would fit on the counter without touching the ceiling! If you’re keeping track, I now have one pie and three ENORMOUS cakes in my kitchen. Then Willow broke my house with her gigantic cake that is so huge, it burst through the ceiling into the 2nd floor of the house. So now I have a hole in the ceiling, one pie, four cakes, and probably diabetes if I attempt to eat all of these baked goods. Day 85 – I got all my sisters and me! I think the apocalypse must be coming because the unthinkable happened today. My sisters and I were all online at the SAME TIME. Naturally we had to take a picture to record this event, as I’m sure it may never happen again. Actually, Ulaa took the picture. I just photoshopped it to death. Short post today because I’m working on a post for the style blog. I would have had it all done earlier, but I went for a movie and Mexican food on the spur of the moment. That’s my favorite kind of day!